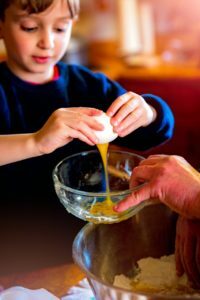 Involve your children in your day-to-day activities by considering them in your kitchen design. If you have children, you know how important your kitchen is to your family. It’s the heart of the home, where everyone gathers to create, nourish each other, and enjoy each other’s company. Many families use their kitchen as a space for their children to study or for the whole family to gather and spend time together, so it’s important that your kitchen works for you and your family. Luckily, there are a few kitchen design elements out there that make kitchens really function for parents and their children alike. Parents can end up spending a lot of time in their kitchen but they may still want to keep an eye on their children. That’s why having some dedicated area for them in your kitchens design to hangout at while you cook dinner—such as an island or a kitchen table—is always a good idea. This way, you can make sure they’re getting their homework done while you’re making food or doing dishes. Keeping a child’s snacks in a lower, accessible cabinet can instill a sense of independency in them. Likewise, keeping space towards the bottom of the fridge for their snacks is a fantastic way to let them take some control of their lives while also making them understand responsibility and healthy eating habits. Another alternative is using a bar fridge or an under-counter fridge. Lastly, keeping a step stool near the kitchen sink is a fantastic way to make sure they wash their hands before and after meals or preparing food. Get your kids onboard with recycling early on! Make both your trash bins and recycling bins accessible and show them what goes where. It may not sound like much fun to adults, but to kids, the whole process of sorting rubbish can actually be pretty entertaining. Just be sure that all containers have lids that seal. Also be sure to be careful around glass jars or tin cans which may be dangerous for smaller children to handle. Corners on countertops can be dangerous for children once they get to a certain height. If you can implement it in your kitchen design, install counters with rounded edges—but if not, you can install corner protectors that are intended to keep everyone safe. Also, as important as leaving some areas accessible is, you want to make any drawers with sharp objects, sensitive appliances, or delicate glassware are locked or protected with child safety catches. This entry was posted on Friday, June 29th, 2018 at 2:55 pm. Both comments and pings are currently closed.